As you know, at Sunspun we have a very soft spot and a great deal of affection for designer, Kirsten Johnstone, and her beautiful designs. Earlier this year we showcased many of those designs in our very first trunk show. Kirsten is a local Melbourne gal who has made a wonderful splash on the international knitting scene. She has designed for such influential companies as Brooklyn Tweed, Quince & Co, Woolfolk, Blue Sky Alpacas, amirisu and Shibui Knits. We are privileged to be able to share her new mini collection for Woolfolk with you. 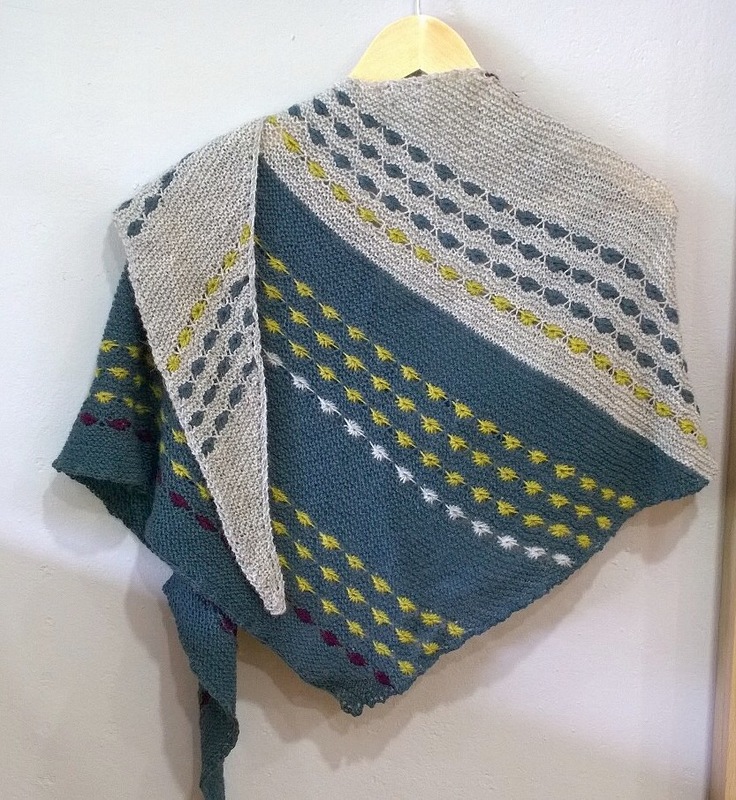 In Kirsten’s words, “the Kei Collection (Kei is Japanese for shape) comprises four designs in Woolfolk Tynd with a unifying Drawstring Element and named after a shape to help ‘tie’ the collection together (bad pun fully intended)”. How exciting! We will be one of the first to see them! There are both accessories and garments in the collection. Have you been in the shop and felt the exquisite Woolfolk yarns? Truly a sensual experience! The softest 100% merino yarn we have ever had in our hands – with the additional desirable qualities of being ethically and sustainably produced. Tynd is a 4ply yarn with a tight twist that creates both an elegant and lightweight fabric. The colour palette is both sophisticated and understated. A perfectly lovely marriage for Kirsten’s designs that also embody both these qualities. The Kei Collection will be in the shop for you to touch, feel and try on! Kirsten will also be present in the shop to answer all your questions. At the previous trunk show she soooo enjoyed meeting you all and being able to help you with pattern and yarn choices. Additionally, Kirsten’s patterns from the Kei Collection will be available for purchase with a 10% discount (Sunspun Members are entitled their usual discount as well) for the duration of the mini launch. Annnnd, Woolfolk Tynd will also be available for 10% off during the Friday and Saturday of the collection launch. Cleverly, two of the designs use only one skein of Tynd so it is the perfect time for you to try this truly superb yarn. So, we hope that you will come along and touch and feel and try on and chat and enjoy the wonderful creations in Kirsten Johnstone’s new Kei Collection! Categories: cardigans, events, exhibitions, Knitting, knitting knitting yarn, meet the maker, Trunk Show, Uncategorized | Tags: Kei Collection, Kirsten Johnstone, knitting events, knitting Melbourne, Melbourne yarn shop, things we love, tynd, woolfolk, yarn | Permalink. Do you love to ‘share’ your yarn experiences with like minded souls? Well, yarn alongs are a fabulous way to do this. You work on the same project/s as others and share your triumphs, tears and successes along the way. Sunspun is running our very first yarn along! We are calling it a ‘yarn along’ because we sincerely believe that knitting and crocheting should each be given moments in the spotlight! So …… what item are we creating in our yarn along? 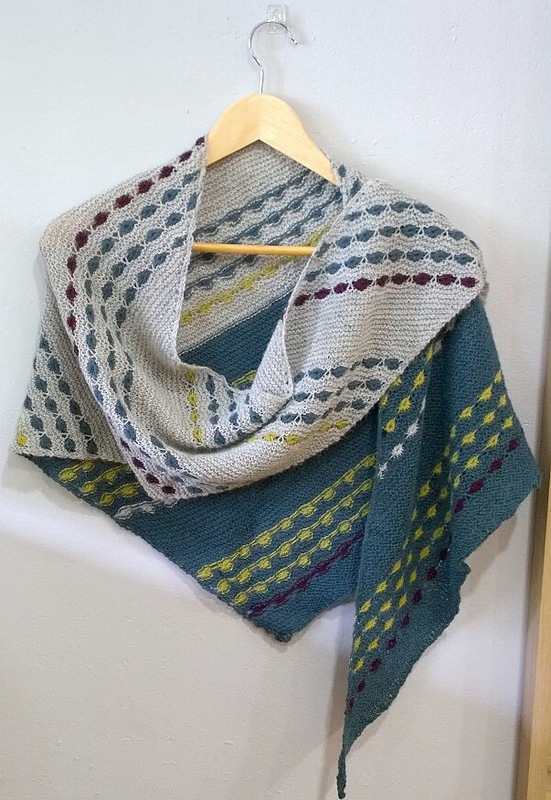 We have chosen a shawl as the project – a lovely accessory that can be made warm for winter using beautiful soft, drapey wools or cool for summer in your choice of lovely cottons or linens. They are relatively quick to finish (! ), almost universally loved and a project that has no pesky fit issues. Winner all round! The pattern can be purchased from us in the shop or directly from Melanie through her ravelry page. You can see from the various completed projects in ravelry just how different Moonraker can look with different colour choices. Our sample has been created using the gorgeous Isager Alpaca 2 – a beautifully soft yarn that is 50% alpaca and 50% wool. In this yarn you need 2 skeins each of your two main colours and 1 skein each of two contrast colours for the ‘flowers/daubs of colour’. 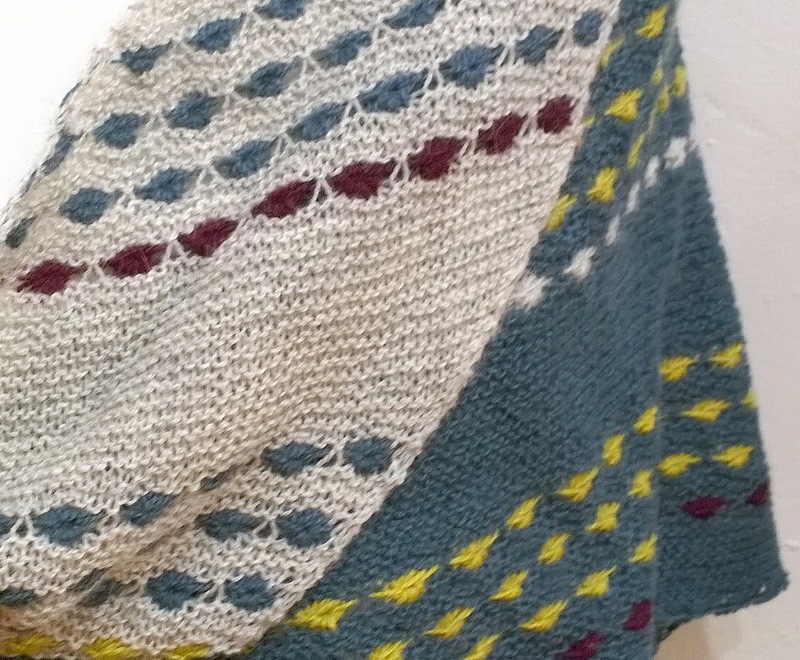 Being primarily garter stitch this shawl is suitable for all knitting skill levels. For the daisy stitch flowers we have put together a video tutorial in our youtube channel for you. They are not difficult but the pattern language may confuse you a little – hence the video tute! 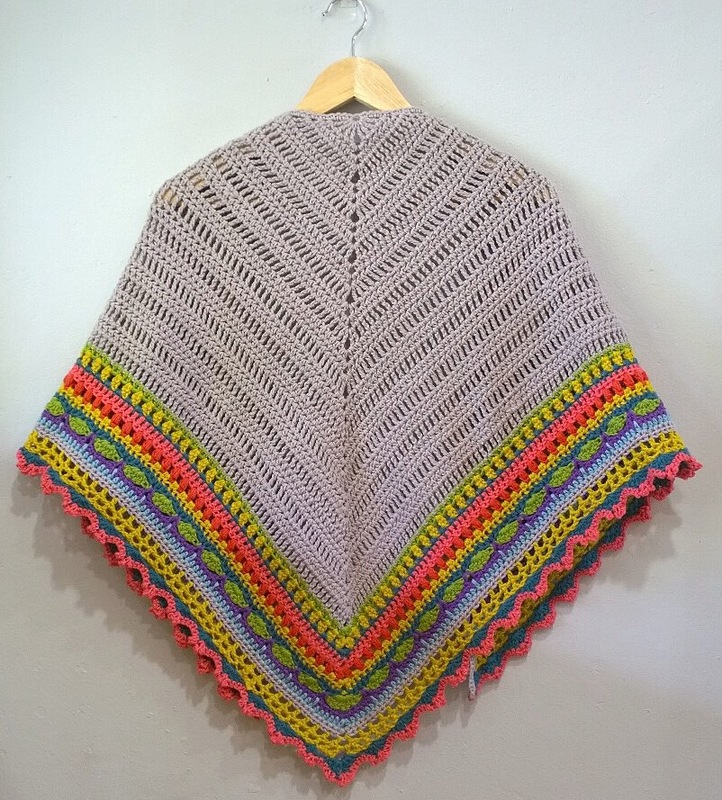 “The Sunday Shawl is a soft & snuggly shawl, perfect for nippy winter days and nights. The pattern can be purchased from us in the shop or directly from Alia through her ravelry page. And as an added bonus Alia has graciously offered a 20% discount to SAL participants – just use the coupon code SUNSPUN at the checkout. 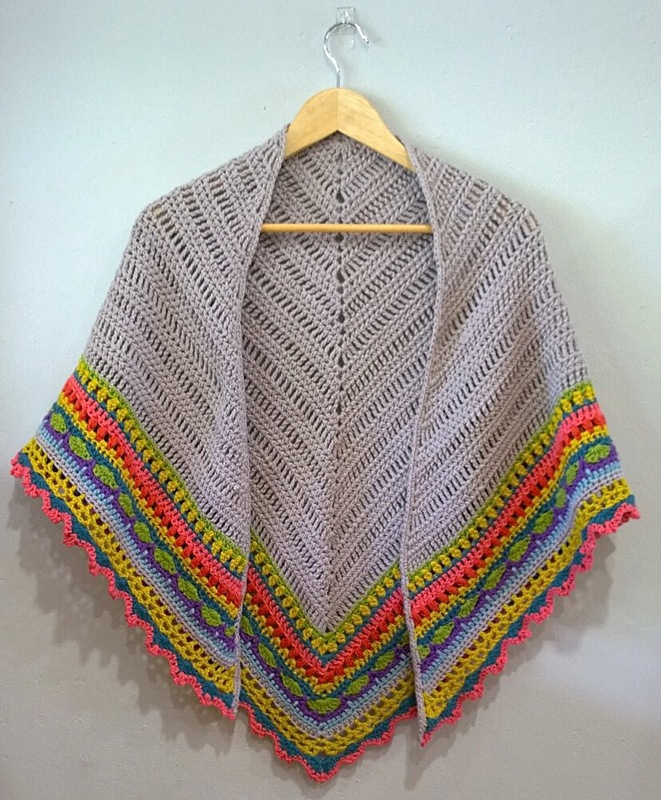 You can see from the various completed projects in ravelry just how different the Sunday Shawl can look with different colour and yarn choices. It should be noted that the pattern as purchased directly from Alia is written in US crochet terminology. We have translated it to Australian terminology for you. If you purchase through the shop we will give you the converted copy. However, if you purchase directly from Alia, just present us with proof of purchase (your ravelry receipt will be fine) and we will supply you the converted version – a pdf copy so you can print it out at home. Our sample has been created using cotton 8ply yarns – we were going for a very light, bright and summery look! Primarily Debbie Bliss Cotton DK yarns. You will need 7 balls of your main colour and 1 ball each of 7 contrast colours. 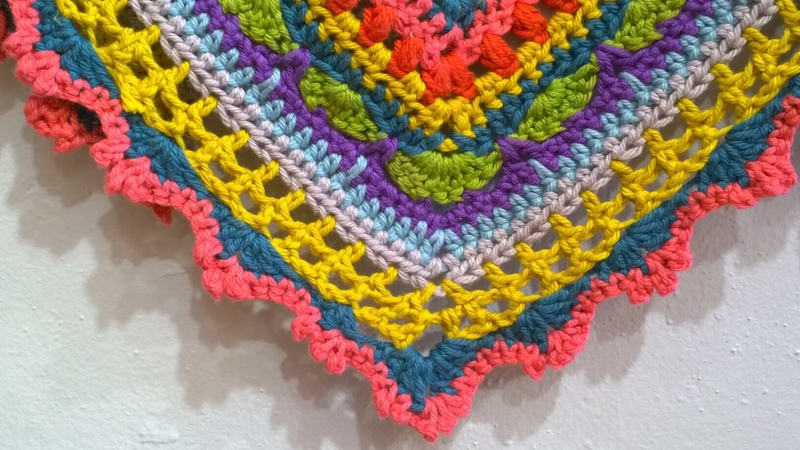 This shawl pattern was chosen for its simplicity – it is suitable for all crochet skill levels. The pattern is beautifully written with extensive photo support for every row. Additionally, we have created a video tutorial in our youtube channel for you showing how to do the magic circle to start. We are having some help sessions in the shop if you would like some hands on assistance. These sessions are free of charge. Just bring your project and your questions and we will sort you out! Friday 27th November and Saturday 28th November morning: 11am – 1pm afternoon: 2pm – 4pm. 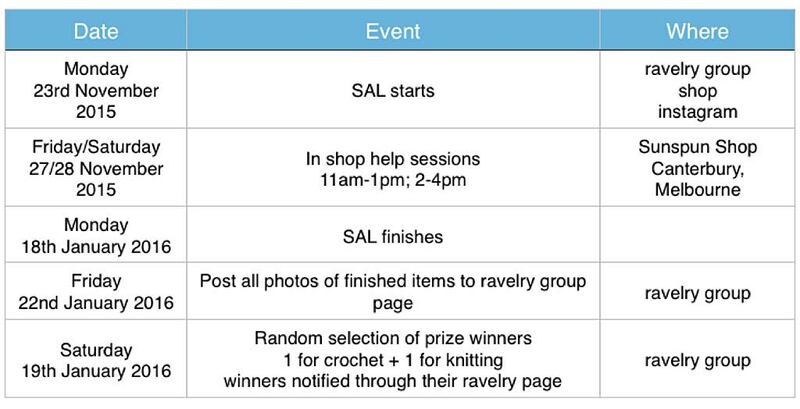 We have established a SAL thread in our ravelry group for you to post photos, ask questions and share tears and triumphs. Please post your finished photos in this thread – by Friday 22nd January 2016. We will choose a winner for our crochet prize and our knitting prize from these pics. The prizes will be randomly awarded on Saturday 23rd January 2016 and communicated through the Group Thread and to the winners individual Ravelry pages. When you share photos in instagram and ravelry and Facebook (notice we have cheekily supposed you will!) please use #sunspunSAL2015. So are you in? Let’s make this fab and create and share. Categories: Uncategorized | Tags: aplaca 2, cotton yarn, crochet events, crocheting, Isager, knitting, knitting events, melanie berg, moonraker, shawlalong, sunday shawl, the little bee, yarn | Permalink.